We chat with fantasy and sci-fi author Neil Williamson about genres and how speculative fiction blurs those lines. I gush over his inventive fantasy book The Moon King, and we get a tease of his next work. He reads us a short story that evokes Glasgow and the make and mend attitude, and we talk about engineering and invention in Glasgow, Scottish language use in writing, the end of “New Weird”, and the pros and cons of indy publishing vs mainstream. Listen, download, or get us from your favourite pod app. Contact us if you can’t find us! Neil Williamson lives in Glasgow and has been writing for a surprisingly long time. His books include The Moon King and The Memoirist and the best of his sixty or so published stories have been shoehorned into two collections called The Ephemera and Secret Language. 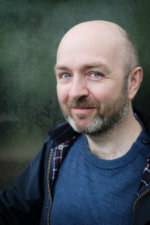 He is has also co-edited two anthologies, Nova Scotia: New Scottish Speculative Fiction, and Thirty Years of Rain, both of which showcase Scottish genre fiction. Over the years his work has been nominated for British Science Fiction, British Fantasy, and World Fantasy awards. All of which he lost. Catch him here at his author blog and buy his books from Newcon Press. This episode sponsored by Geeky Ninja – amazing artworks inspired by our favourite nerd fandoms for games and movies. Poster prints or tshirts available. Eye-catching and very high quality works of art that will adorn your walls or make ideal gifts for that superfan in your life. 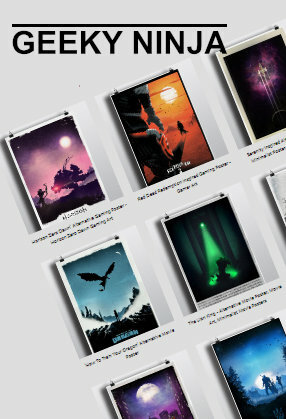 Shop geekdom posters at Geeky Ninja today! Expanding on some of the things mentioned in the episode. A helpful guide to read along! Glassholm – the island setting for Neil’s novel The Moon King. Neil’s story is set in a Glasgow tenement flat – apartments built in the 19th century that are sometimes little timecapsules. Here’s a link to one preserved as it would have been in the early 20th century. A “footerer” – a person who footers around with stuff, i.e. fiddles or tinkers with it. Controversial etymologically. Acid drops – old fashioned sweeties with a sharp taste. A “numpty” is a foolish person. Simmet (or Semmit) – a singlet or vest, a sleeveless undershirt. A “press” is a kind of cupboard, often built into an alcove in Glasgow tenements. Scottish inventors and scientists: John Logie Baird, James Clerk Maxwell, Lord Kelvin, James Watt.